BACKGROUND: Naphthalene exposures for most non-occupationally exposed individuals occur primarily indoors at home. Residential indoor sources include pest control products (specifically moth balls), incomplete combustion such as cigarette smoke, woodstoves and cooking, some consumer and building products, and emissions from gasoline sources found in attached garages. 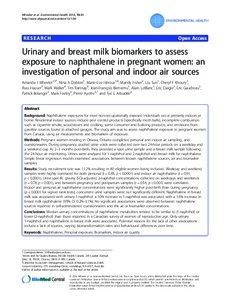 The study aim was to assess naphthalene exposure in pregnant women from Canada, using air measurements and biomarkers of exposure. METHODS: Pregnant women residing in Ottawa, Ontario completed personal and indoor air sampling, and questionnaires. During pregnancy, pooled urine voids were collected over two 24-hour periods on a weekday and a weekend day. At 2-3 months post-birth, they provided a spot urine sample and a breast milk sample following the 24-hour air monitoring. Urines were analyzed for 1-naphthol and 2-naphthol and breast milk for naphthalene. Simple linear regression models examined associations between known naphthalene sources, air and biomarker samples. RESULTS: Study recruitment rate was 11.2% resulting in 80 eligible women being included. Weekday and weekend samples were highly correlated for both personal (r = 0.83, p < 0.0001) and indoor air naphthalene (r = 0.91, p < 0.0001). Urine specific gravity (SG)-adjusted 2-naphthol concentrations collected on weekdays and weekends (r = 0.78, p < 0.001), and between pregnancy and postpartum samples (r = 0.54, p < 0.001) were correlated.Indoor and personal air naphthalene concentrations were significantly higher post-birth than during pregnancy (p < 0.0001 for signed rank tests); concurrent urine samples were not significantly different. Naphthalene in breast milk was associated with urinary 1-naphthol: a 10% increase in 1-naphthol was associated with a 1.6% increase in breast milk naphthalene (95% CI: 0.2%-3.1%). No significant associations were observed between naphthalene sources reported in self-administered questionnaires and the air or biomarker concentrations. CONCLUSIONS: Median urinary concentrations of naphthalene metabolites tended to be similar to (1-naphthol) or lower (2-naphthol) than those reported in a Canadian survey of women of reproductive age. 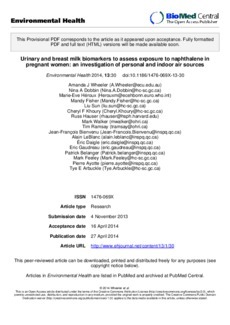 Only urinary 1-naphthol and naphthalene in breast milk were associated. Potential reasons for the lack of other associations include a lack of sources, varying biotransformation rates and behavioural differences over time.